After a one-year hiatus of these two teams’ season culmination in Salem, we’re again getting to see Mount Union and UW-Whitewater duke it out for the Walnut and Bronze. Oh, but what an exciting trip is has been to get to this point, as both of these two teams won by just one point last weekend. Pat, Keith and Ryan bring you an expanded Triple Take this week, with a few guest prognosticators. And, of course, not only are we doing scores, but we’re also throwing in a bit of analysis. It’s been a D3football.com tradition since 1999. As always, we welcome your remarks and your own picks in the comments section below! I came into this week with a specific result in mind. Whether I could find enough points to make it happen, though, I wasn’t quite sure. Eventually I end up with about the prediction I’d like. Could I see UW-Whitewater scoring enough points on offense to justify the “just barely more than one score” prediction that was on my mind. Mount Union should score enough points to keep this game close and UW-Whitewater needs to really avoid the early-game issues they’ve had the past two weeks. If so, I think the Whitewater defense outperforms the Mount Union offense. I usually try to watch as much of both teams as I can and give a serious pick based on expected on-field factors. But I have a couple of problems this year. While I’ve seen all or part of five Mount Union games, I haven’t seen enough UW-Whitewater to comfortably form a really good opinion. (I do plan to watch the Thursday 3 p.m. ESPNU re-air of the UMHB semifinal on DVR before game time, so I’ll be sharp for our annual Web cast). My second problem is that UW-W fans have specifically requested that I pick against them as I have the past two weeks, when they’ve beaten the No. 2 and No. 3 teams in our poll to advance; Now they’re facing No. 1. So, because I really have no idea who’ll win Round 8 (Isn’t that the way it should be?) and because it will make both sides happy, even our picks at 3-3 and the series at 4-4, I’ll take the Purple Raiders. (I’m not as terrible at this as I thought; I’ve picked the past five Stagg Bowl winners correctly in Triple Take, including UW-W in ’09, ’10 and ’11). I just mentioned myself 10 — make that 11 — times and haven’t mentioned a single player. Yuck. 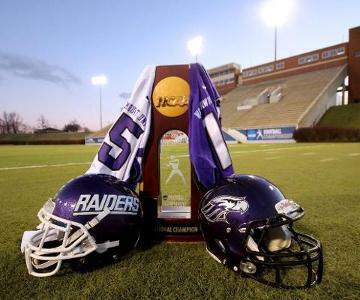 Anyway, it’s scary to think what it means for the rest of D-III if Mount Union replaces 17 starters and its legendary coach and still wins the Stagg Bowl, but they’ve got Kevin Burke, taking his place alongside the great D-III quarterbacks, playmakers around him (look for a big play from Luc Meacham) and a defense that can be gashed but is opportunistic as well. The Warhawks’ front seven will cause problems for the Purple Raiders’ O-line, but in the fourth-quarter play that defines the game, I can’t envision Burke failing. You had your chances, D-III sub-elite class. Here goes nothin’. Mount Union 21, UW-Whitewater 20.